Look! We have made a very charming paper plate snowman. 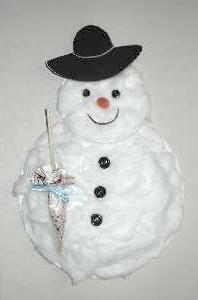 This might be the only chance you get to make this lovable character, because where the snow usually falls, there might not be any this year, or you may live in a country where it never falls. To make him there are some materials you need to gather before you start. 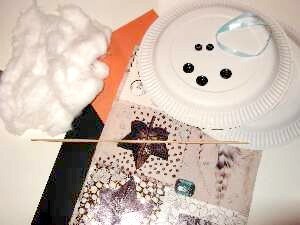 Cotton wool, Ribbon, PVA glue, and scissors. For the head, cut out the inner circle of one of the paper plates. Spread some PVA glue over the entire surface and stick a thin layer of cotton wool to it. It`s ok if it goes over the edges. That will make it look like it`s made of real snow. If you have 2 small dark shirt buttons, they are ideal for eyes. But 2 small circles made from black card will do. Stick them in place. 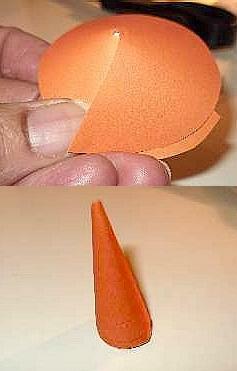 The traditional nose that was used was a carrot, so we will make a carrot from orange paper for our paper plate snowman. To do that, cut a circle about 2 inches across and then make a cut from the edge to the center. Now overlap the cut edge over and keep twisting until you get a cone shape. When it is tight enough, stick down the edge and then glue onto the face. For the body, we will use the whole of the other paper plate. 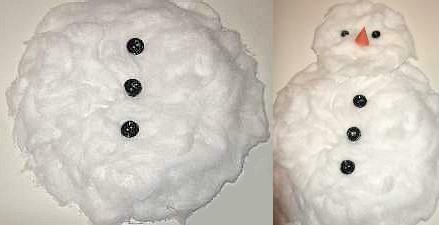 Cover it with glue and stick a thin layer of cotton wool over it like you did with the head. Now stick on the 3 large buttons, evenly spaced. The next stage is to attach head to body which is easy. A little glue at the top of the body will hold the head in place. But the snowman needs some protection from the cold. A hat and umbrella will do nicely. Here is how to make them. Chalk a white outline of a hat onto black card, cut out the shape, and glue it onto his head. 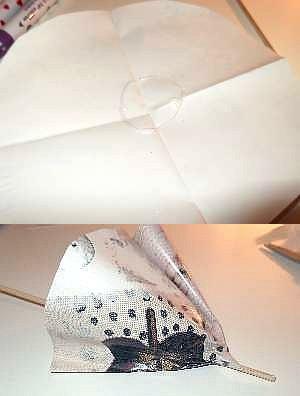 To make the umbrella, fold the wrapping paper in two, turn it sideways and fold it again. now cut out a quarter circle so that when you open it up you will have a circle. Paste some glue around the center. Shorten the skewer to a size that will fit, about 2/3 of the normal length and push about 1/2 inch of it through the middle of the paper. 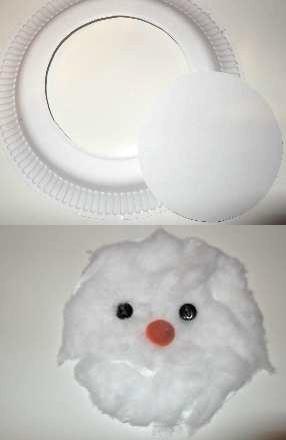 Now the paper plate snowman is happy so you can stick on his smile with a piece of wool, cord, or jute. But something is missing that would make him even happier! 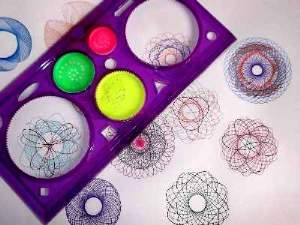 If you know what it is, make your own snowman wearing the missing item, and using the form below, send in a picture of it and a little story, and I will send you a Spirograph Ruler. If you like making things from paper plates, here some more paper plate crafts. 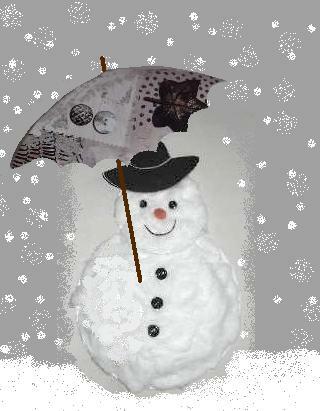 The snowman has forgot to wear something?